I don’t make any secret of the fact that I kind of have a talent crush on Ilsa J. Bick. And I’m OK with that. 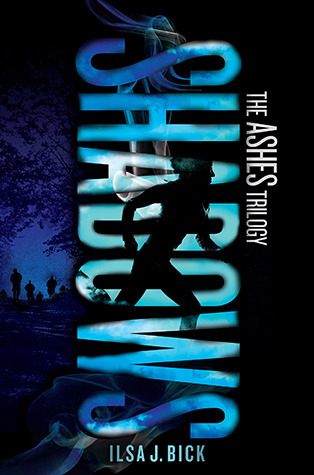 SHADOWS is the sequel to ASHES, so if you haven’t read it, you might want to skip out on the Book Talk today for fear of being exposed to many-a-spoiler. Also, if you haven’t, check out my Book Talk on ASHES from last year to see if the series is for you. If you’re not weak-stomached, I think you should try it out. For those of you who aren’t so sure how you feel about zombies… well, this book is gutsy in more ways that one. ASHES left Alex outside of Rule, faced with a pile of bone and gristle. Tom was lost, Ellie taken. SHADOWS finds Tom being cared for by an elderly couple who discovered his bleeding body back at the gas station, and nursed him back to health. Now his only motivation is to find Alex, and save her from whatever fate she’s facing. His PTSD from Afghanistan is only exacerbated by the grisly present though, and he has to deal with his past before he can try to guarantee himself – or Alex – any kind of future. But Alex is fending for herself as she fights her way – literally tooth and nail – through a group of Changed determined to claim her as their own. Wounded and loosing her own precarious grip on reality, Alex is kept with a group of adults to be bound, and herded together toward an unknown destination, while the Changed pick one at random to be each evening’s meal. Alex’s concerns go beyond being the next snack. Her tumor may have saved her from the first wave that turned normal teens into Change, but it seems the Changed are still changing. As they evolve into cohesive groups that plan, execute, and torture, Alex feels her own brain wavering between being a human being… something else.